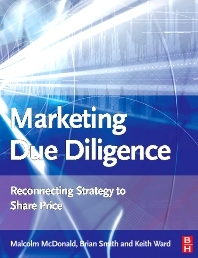 The ultimate test of marketing investment, and indeed any investment, is whether it creates value for shareholders. But few marketing investments are evaluated from this perspective. Increasingly, boards of directors and city analysts the world over are dissatisfied with this lack of accountability. • Does the promised market exist? • Will the strategy deliver the market share promised? • Will the market share create shareholder value? Surely, the time has come for marketing directors to take their rightful place in the boardroom by proving that what they are doing creates shareholder value added?